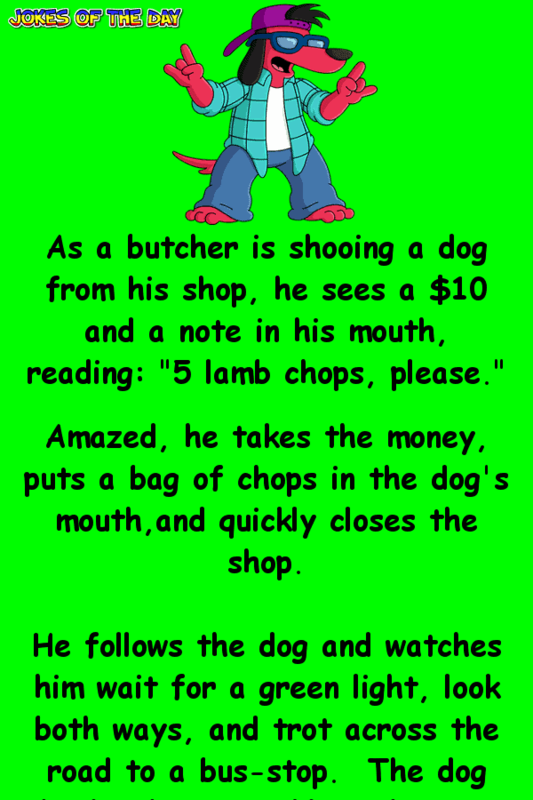 Amazed, he takes the money, puts a bag of chops in the dog’s mouth, and quickly closes the shop. He follows the dog and watches him wait for a green light, look both ways, and trot across the road to a bus-stop. The dog checks the timetable and sits on the bench. When a bus arrives, he walks around to the front and looks at the number, then boards the bus. As the bus travels out into the suburbs, the dog takes in the scenery. After awhile he stands on his back paws to push the “stop” bell, then the butcher follows him off. The dog runs up to a house and drops his bag on the step. He goes back down the path, takes a big run, and throws himself -Whap!- against the door. He does this again and again. So he jumps on a wall, walks around the garden, beats his head against a window, jumps off, and waits at the front door. A big guy opens it and starts cursing and shouting at the dog.